Activated charcoal and active carbons are widely used in cosmetic, medical and industrial products. For best results, active charcoal must be uniformly dispersed: The smaller the particle size, the larger the particle surface, the better the activity. Ultrasonic dispersion gives a high particle surface and homogeneous distribution. Ultrasonic probe homogenizers are well-known as reliable tool to disperse nano materials into suspensions. Sonication breakes the particles into sub-micron and nano size and gives a uniform particle size distribution. The dispersion is crucial for the material’s quality since the dispersion state determines whether the particles will settle out or remain in suspension. 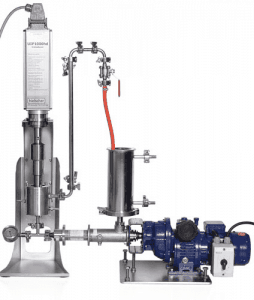 Hielscher’s powerful ultrasonic dispersers are available for small, mid-size and large volumes. The ultrasonic dispersion can be run in batch or continuous flow-through mode. 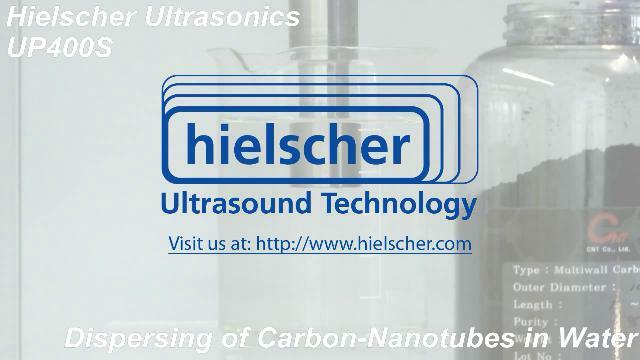 Contact us today, we will be glad to recommend you the suitable ultrasonic equipment for your research or production! Activated charcoal and medicinal charcoal is a fine-grained, porous material with a sponge-like structure. The small, low-volume pores increase the surface area available for adsorption or chemical reactions. Due to this sponge structure, charcoal particles are highly adsorbent and can bind unwanted substances (e.g. oils, dirt, talc, toxins) effectively. Its adsorbing function turns activated carbon into a very effective cleansing substance which is used in pharma and medical products, cosmetics, food and industrial adsorbents. A finer dispersed active carbon offers higher chemical reactiveness and can be used in smaller amounts. This means that a narrow particle size distribution can provide significant operating benefits. Sonication is the ideal method for a fine-size dispersion of active charcoal. Since activated charcoal offers a large surface area, it is a very effective adsorbent. The finer the particle size of active carbon / charcoal, the higher the surface area and thereby the faster the rate of its adsorption kinetics. What is Activated Carbon Used for? Fine-size dispersed active carbon is widely used in manifold applications and industries. Ultrasonic dispersing results in a high surface to volume ratio of the particles, which gives them a very high reactivity (e.g. adsorbent, catalytic). Activated charcoal is heavily used as an additive to many products in the pharma, food & beverage, cosmetic and chemical industry, where the activated carbon acts as decontaminant, adsorbant and cleanser. Activated carbon is heavily used during the finishing of metal for purification of electroplating solutions (e.g. for the removal of organic impurities). The activated carbon is used to remove manifold undesired substances from the product. For example, carbons are used to remove contaminants, unwanted colors, organic impurities, intermediates. It is used during purification stages in the manufacturing of pharmaceuticals, foods & beverages, wine & liquors, chemicals & specialty chemicals, and may other industries. Activated carbon mixtures are used as stationary phase in low-pressure chromatographic separation of carbohydrates (mono-, di-, and trisaccharides) in analytical or preparative protocols (ethanol solution as mobile phase). Active charcoal is used as pesticide, additive in animal feed and processing agent.